Free Shipping Day is a one-day shopping event during which participating merchants offer free shipping with delivery by Christmas Eve. The third-annual event is scheduled this year for Thursday, Dec. 12, 2013. 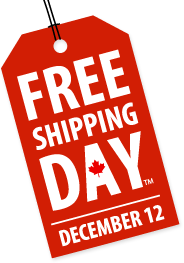 Visit www.freeshippingday.ca for more information.